Enjoy these savory items, baked fresh every day. 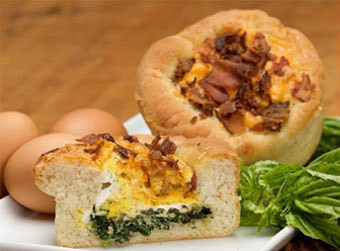 Burglaur | cage-free eggs, Spinach, Pesto and Crumbled bacon baked into a Foccacia dough cup and topped with a three-cheese blend. Stuffed Croissants | Croissants filled with fresh ingredients and cheese and baked to perfection daily. Filling includes ham and cheese or spinach and asiago cheese. Quiche | cage-free eggs, cheese and fillings baked in a flaky crust.